MANILA, Philippines - Typhoon Karen (international name: Sarika) has accelerated further and posed a serious threat over Aurora Province, state weather bureau PAGASA announced on Saturday, October 15 at 5:00 p.m.
PAGASA also raised tropical cyclone warning signal (TCWS) No. 3 (121-170 kph expected in 18 hours) in 10 areas: Pangasinan, Northern Zambales, Tarlac, Nueva Ecija, Aurora, Northern Quezon including Polilio Island, La Union, Benguet, Nueva Vizcaya and Quirino. 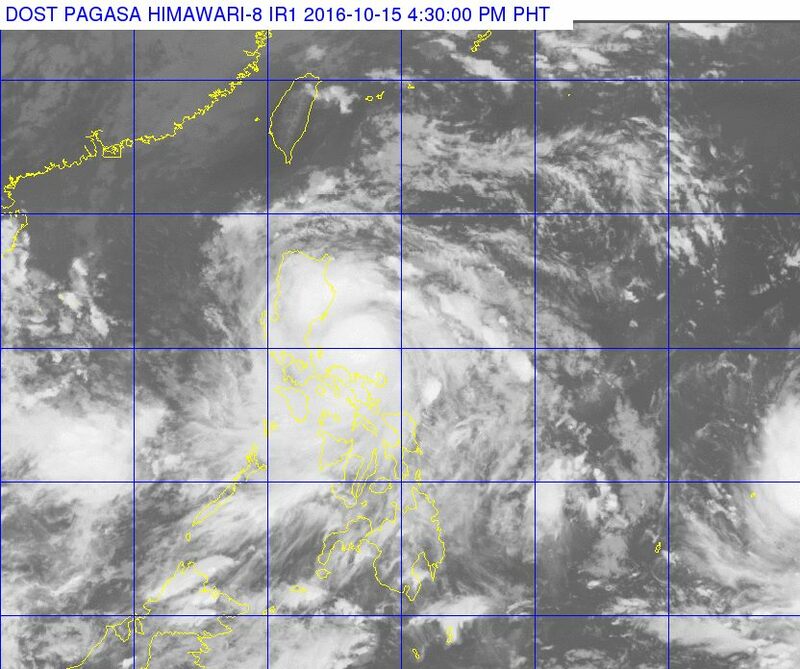 At 4:00 p.m. today, the eye of 'Bagyong Karen' was located based on all available data at 205 km East of Infanta, Quezon(15.0°N, 123.5°E). Typhoon Karen has maximum sustained winds of up to 130 kph near the center and gustiness of up to 180 kph. 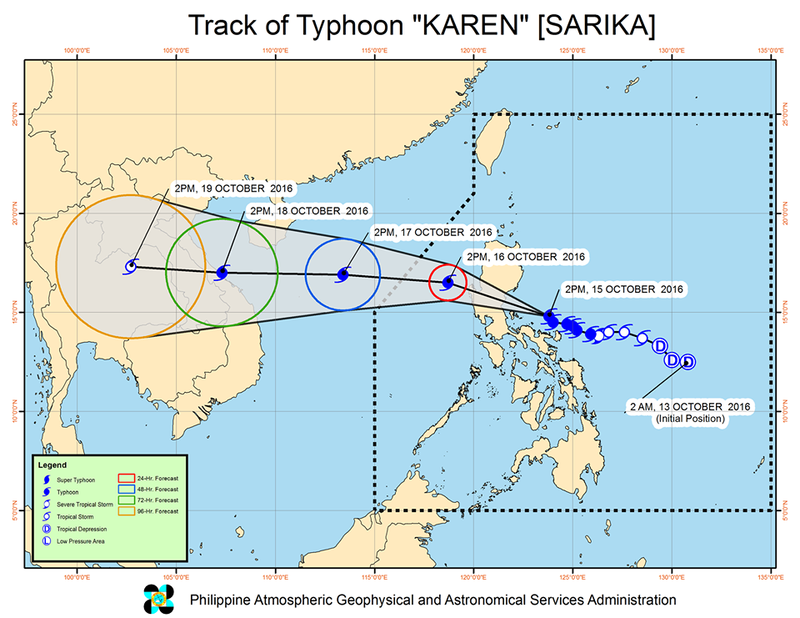 'Karen' is forecast to move West Northwest at 22 kph. Meanwhile, Signal No. 2 (61-120 kph expected in 24 hours) is up in the following areas :Ilocos Sur, Southern Isabela, Mt Province, Ifugao, Rest of Zambales, Pampanga, Bulacan, Bataan, Rizal, Metro Manila, Rest of Quezon, Camarines Norte and Catanduanes. Signal No. 1 (30-60 kph expected in 36 hours) was raised over the areas of Ilocos Norte, Abra, Kalinga, Rest of Isabela, Southern Apayao, Southern Cagayan, Oriental Mindoro, Cavite, Batangas, Laguna, Marinduque, Camarines Sur, Albay, Including Burias Island. Estimated rainfall amount is from moderate to heavy within the 500 km diameter of the typhoon. Possible occurrence of storm surges along the coastal communities of areas with TCWS #3 and #2 and flashfloods and landslides over all areas with TCWSs. 'Karen' is expected to make landfall over the Aurora province tomorrow early morning. Fisherfolks and those with small seacrafts are advised not to venture out over the northern seaboard of Northern Luzon and over the Northern and Eastern seaboards of Samar.